As the altitude increases, the air gets thinner. To be precise, the amount of oxygen that is pumped into the air sacs (lungs) is reduced. From an altitude of 5,000 meters and above, we breathe in only half as much of this vital gas. That is why pressurized cabins create a pressure level equivalent to that on an alpine peak of 2,400 meters. But even this pressure level often leads to headaches, tiredness and discomfort. Dürr Technik has therefore developed the OXYFLY oxygen generator, which constantly supplies passengers with oxygen produced on board. 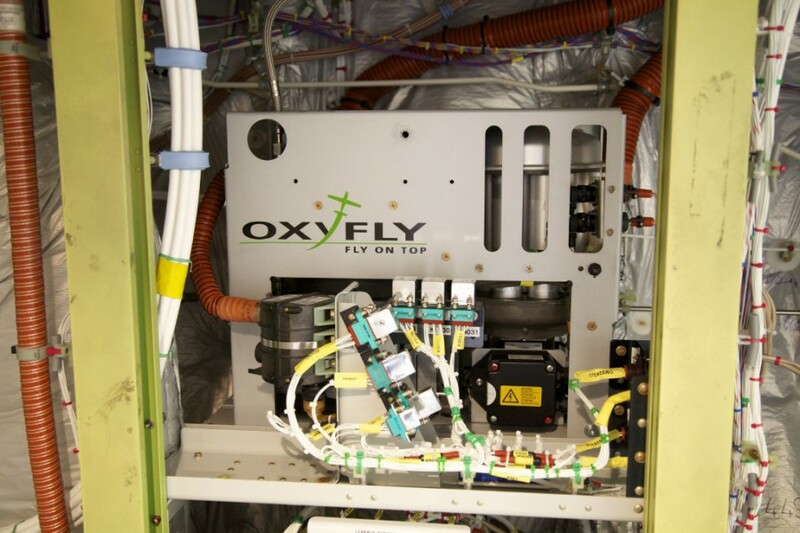 Now, Lufthansa Technik AG also install a modified version of OXYFLY in its VIP aircraft. Being able to breathe at cruising altitudes as if you were on the ground is truly a luxury – a luxury that Lufthansa Technik AG offers its passengers on VIP aircraft. This is made possible by the “On Board Oxygen Generation System“ (OBOGS), which the specialists in the VIP & Executive Jet Solutions Division of Lufthansa Technik AG have developed in cooperation with the German manufacturer Dürr Technik. Using this oxygen generator made by Dürr Technik, Lufthansa Technik AG now provides passengers with a continuous supply of therapeutic oxygen produced on board. Lufthansa Technik AG has now certified this system. The experts have successfully carried out a large number of tests according to RTCA / DO-160G and FAR Part 25 – e.g., Temperature Compatibility, Electromagnetic Compatibility, Vibration Protection and Flammability & Fire Resistance. A supplemental type certificate (STC) issued by the European Aviation Safety Agency has also been obtained to confirm the safety of the installation. OBOGS is a modification of the OXYFLY oxygen generator made by Dürr Technik. 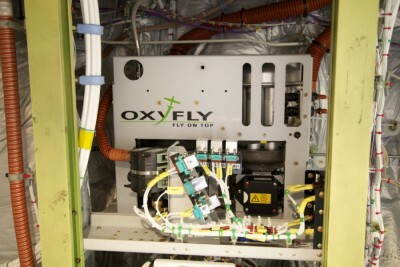 OXYFLY is primarily used by pilots and passengers of unpressurized aircraft. An oil-free compressor presses air into an oxygen module that increases the oxygen concentration to as much as 96%. Via hose-sets with nasal cannulas the aircraft occupant breathes in pleasantly preheated pure oxygen. This enables planes without pressurized cabins and their occupants to fly up to an altitude of 5,500 meters (18,000 ft). Flying above the cloud ceiling, they reach their destination quicker and efficiently with lower fuel consumption. The use of OXYFLY offers many other advantages. The plane flies mostly “above the weather” and thus avoids an important risk factor. Unlike systems that use oxygen bottles, the unlimited oxygen supply works completely without a storage tank. Because the oxygen is constantly being produced freshly on board, no oxygen bottles have to be bought, filled, stored and transported. Thanks to OXYFLY, stopovers for refilling oxygen bottles are a thing of the past. Thus pilots can plan their route and altitude more flexibly and comfortably thereby reducing tiredness on night flights or on flights involving frequent climbs. The fact that all persons on board are optimally supplied with oxygen is good for their health and avoids headaches and dizziness. The hazards associated with oxygen bottles being transported on board can be excluded with OXYFLY. Currently Dürr Technik is cooperating with partners in the aviation industry with the intention of applying for STCs for further aircraft types. 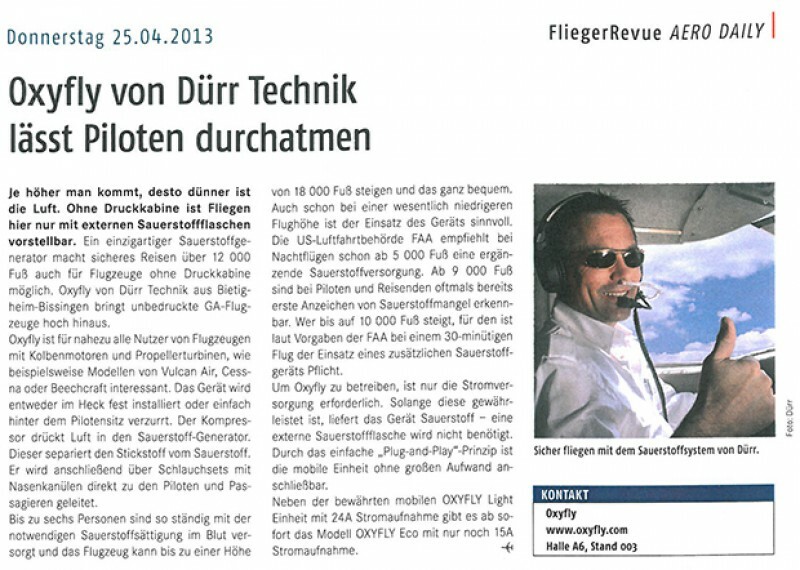 As OXYFLY is also a part of the standard equipment of Vulcanair's A-Viator model, Dürr Technik is looking to equip further planes with the oxygen generator as a standard feature. Moreover, Dürr Technik is planning the use of the oxygen generator in military aircraft. In future, the "On Board Oxygen Generation System" (OBOGS) will provide a continuous and completely unlimited supply of therapeutic oxygen via a mask on board a VIP aircraft. A maximum of two connections are possible for each unit. The complete unit weighs around 30 kilograms with dimensions similar to those of a desktop PC. In response to a special customer request, Lufthansa Technik has succeeded in integrating an off-the-shelf device from the cooperation partner, Duerr Technik GmbH & Co. KG, in the complex technical environment of any VIP customer aircraft. The OBOG System can be installed as part of a retrofit update or enhancement. It does, however, require individual modifications on board, as an appropriate location has to be found for the equipment, cables have to be laid and control panels have to be installed. Thanks to their compact dimensions and low weight, both systems can be installed in any aircraft type during initial fitting or as a retrofit installation as part of modification work. Both systems are approved according to RTCA DO-160G and tested and authorised in accordance with EASA guidelines for aviation technology. "The A-VIATOR; a certified larger twin turbine aircraft derived from the P68 Series. The aircraft is unpressurized so it’s still un-complicated and features an innovative OXYFLY brand system that allows continous oxygen generation in the cabin through an innovative compressor, delivered via comfortable cannulas placed on the headsets. The OXYFLY allows the pilot and passengers to fly the aircraft at “pressurized” flight levels for an indefinite time without the need of recharging the oxygen because there are no bottles."